1. A skull cap is approved by the Authority if it meets (BS) EN 1384: 2012*, PAS 015: 2011 or (CSN) EN 1384: 2012*. * (BS) EN 1384: 2912 and (CSN) EN 1384: 2012 will be removed as acceptable standards on and after 1 January 2017. 6. A safety vest must conform to (BS) EN 13158: 2000 (level 1 only)*, (BS) EN 13158: 2009 or (CSN) EN 13158: 2009. *see ‘Forthcoming Rule Changes’ on 3 November 2014 for further change effective from 1 April 2015. Alice Mills and Rob Hawker feature on front page of Racing Post! 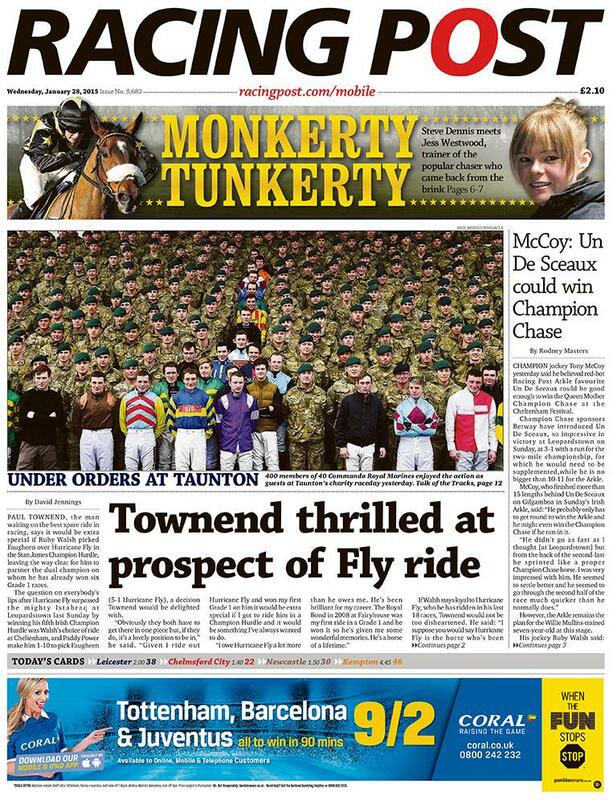 Excellent to see not only the winning partnership of Alice Mills and Monkerty Tunkerty on the front page of today’s Racing Post but also Monday’s Ludlow winning jockey Rob Hawker wearing the winning red and white quartered colours too! 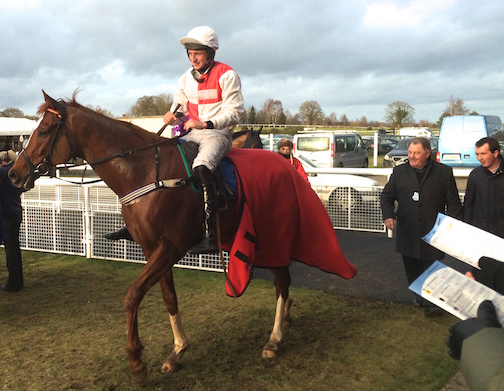 It was a busy day today for amateurs with races both at Ludlow and Wolverhampton. Many congratulations to Robert Hawker who enjoyed success at Ludlow in the largest field of the day, with 17 runners in the AJA Amateur Riders Handicap Hurdle. 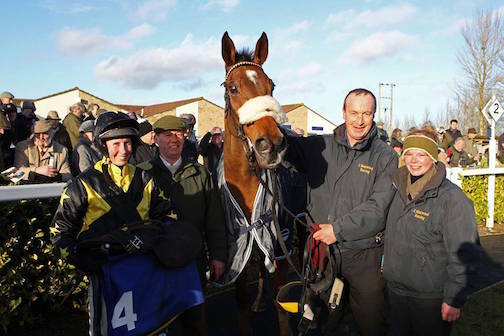 Defying top weight on ASCENDANT for Johnny Farrelly, they won going way much to the delight of owner Alan Clegg who was visiting the course for the first time from his home in Plymouth. Not so lucky was Brodie Hampson who sustained a broken collar bone when her horse ARISTOCRACY fell at the third last when still well on contention. Get well soon Brodie! 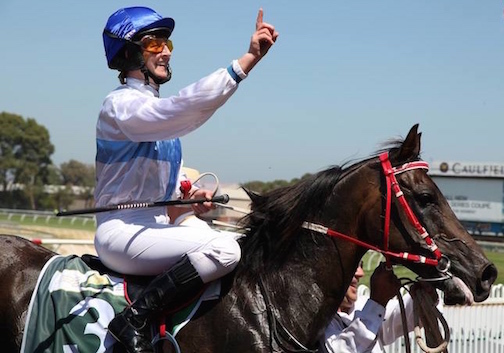 Meanwhile over at Wolverhampton 2014 Epsom Gentlemen’s Derby winning jockey Ross Birkett landed the 6f handicap on WATERLOO DOCK who was running for the first time on Tapeta. All did not go to plan with front running tactics in mind as the horse reared when the stalls opened, but Ross kept the horse wide and enjoyed a game win. This was a great send off for Ross who leaves Newmarket for Australia in a week to work for Gai Waterhouse in Sydney where he will be riding 12 lots a morning. The 3-month trip was won by Ross under the Alex Scott scholarship scheme and will keep him in great shape before returning to the UK in May. Amateur riders are being offered advice from former professional jockeys as part of the British Horseracing Authority’s Jockey Coaching Programme (JCP). 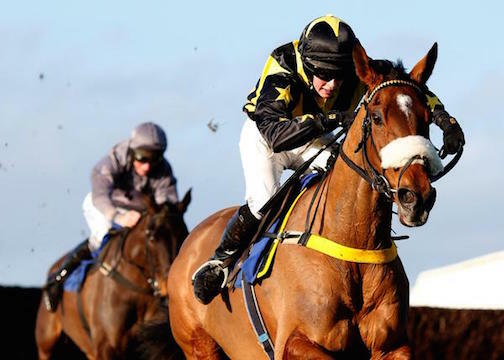 A series of workshops run by former professional jockeys are being put together. While initially set up to benefit conditional and apprentice jockeys, the BHA has recognised the importance of including amateur and point-to-point riders. An increasing number of young people – many having ridden in pony races – are now spending a season or two as amateurs before turning professional. The workshops will review and enhance technical and tactical skills, discuss fitness and nutrition and evaluate race-riding skills. A fee of £10 will apply. 5 February: Northern Racing College, Doncaster, (4 – 7pm) with Tom O’Ryan. Riders should contact Jennie Durrans on 01638 665103 or e-mail jennie@brs.org.uk. 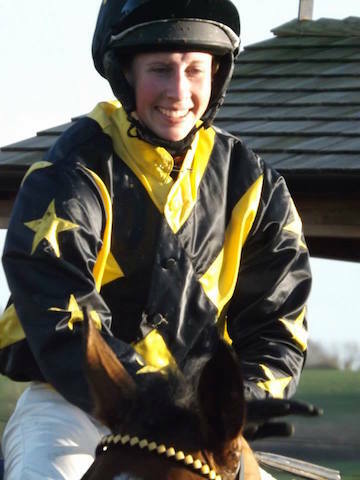 Many congratulations to Alice Mills, who enjoyed an unforgettable victory today and the biggest win of her career when partnering MONKERTY TUNKERTY for owner-trainer Jess Westwood in the Somerset National at Wincanton. Riding with supreme patience, Alice held her horse up until creeping into the picture and taking up the lead two from home. Monkerty Tunkerty stayed on well to draw clear from the last and be pushed out to win effortlessly by 10 lengths. This was a particularly impressive performance considering how the 12-year-old horse sustained a career threatening cut to his leg in this same race last year. 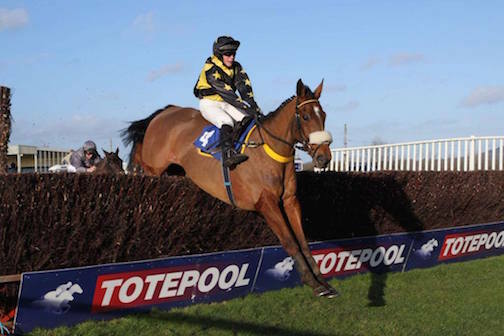 He was lovingly nursed back to health by devoted Jess Westwood, herself an ex-amateur jockey whose riding career was cruelly cut short by a serious head injury sustained in a point-to-point fall 3 years ago. Thanks to the generous support of Lara Sawaya, Executive Director of the HH Sheikh Mansoor Bin Zayed Al Nahyan Global Arabian Horse Flat Racing Festival, 2015 offers another exciting year of Arabian racing around the world which is open to lady jockeys who are able to ride at 9 stone and have ridden at least 5 winners either on the Flat, over Jumps, Arab racing or a combination of these. If YOU would like to represent Great Britain in this incredible ladies Arabian world series then please contact the AJA. All flights and accommodation are paid for by our generous hosts and we are most grateful to Lara Sawaya for all of her hard work and continuing support. As from 1st January 2015, the cost of AJA annual membership (which gives a full 12 months cover from whatever date you join) will rise from £90 pa to £100 pa. AJA membership automatically insures its members for riding out anywhere worldwide. AJA membership cost represents fantastic value for money, being available to anyone under 70 years of age, regardless of whether or not they are a licensed jockey. Please note that cover is for temporary disability only, and there is no cover for permanent disability, third party or death. Benefit is for £150 to be paid after the first 35 days incapacitated for up to a maximum of 52 weeks.